The opportunity to place your products on Amazon is enticing as it is such a large market. If it's done properly you'll see good sales and profits, but how do you get your products on there in the most effective manner? It's a problem to have your products listed on multiple websites as ensuring all the details (such as price, descriptions, etc) are consistent can be a real struggle. If you need to change the price for an item that is listed on multiple sites, then you have to log on one by one and remember the specific process for updating the costs on each website. This reality of having your products listed on multiple sites like Amazon is not only laborious but it also extremely error prone and as your store grows in size; it only becomes a bigger and bigger issue. We have the solution you need to eliminate the chances of errors and time wasted. Our Amazon Product Exporter will easily export your products over to Amazon, allowing you to reap the rewards of greater exposure. Our tool will ensure that your products match in prices, description, images... whatever needs to be synchronised; for both your shop and Amazon. 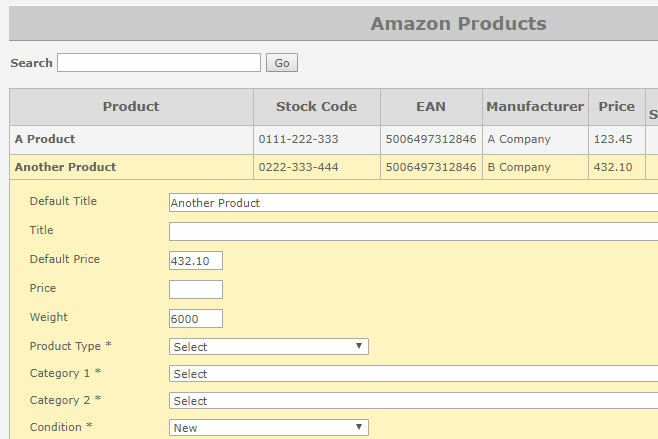 This is a huge time saver for you and ensures that all products are managed in one central location. Simply update your products and wait for the changes to be propagated to Amazon. Our tools will export new products, sync existing and can even import all your orders for centralised management. Let us make managing your exported products to Amazon a breeze. No matter how your site is setup, we're sure we can help. Contact us today on 03330 220 990 to see how we can help you.